Hi there everybody. Today’s post includes a brief round-up of the last few months, with more bits and bobs added. For example, there is a discussion about what’s going on with my nails, some new-to-me nail care products I LOVE, and other stuff that’s been going on behind the scenes to share. Also – I thought it would be fun to include a bit about me as a little bonus, especially to welcome all my new followers – Yay! What do you think? Should be at least interesting, right? Of course, right. Because I started off the year looking back over 2016, I spent a bit of January’s energy there. And, February and March were not particularly fantastic months for me in terms of time able to dedicate to nail art. However, putting my positivity hat back on…I did have a few nail art posts I was pretty tickled with if I do say so myself. Frequently relying on the mantra of “Done Is Better Than Perfect”, I completed eight nail art looks these past few months. Not a stellar number, but I’m grateful for each and every good day that I get one accomplished. It’s glaringly obvious by this collage as to which design was my favorite. However, in my defense, there aren’t a lot of choices if you want to make a square collage out of eight square photos. I’m curious – which one did you like the best? New stamping polishes and getting better acquainted with gels were the main highlights this quarter. Despite the outcome, I also had a lot of fun participating in the piCture pOlish nail art competition with the drag marble smoosh — something I’m itching to do again. And, I’m intrigued to keep playing with the new artistic possibilities with using gels as I did with the “melting snowflakes”. It’s inspiring to have all the different mediums in my arsenal – regular polishes, stamping polishes, acrylic paints, and now gels too. It seems like a lot, but actually, it’s been a few years of acquiring the different items. 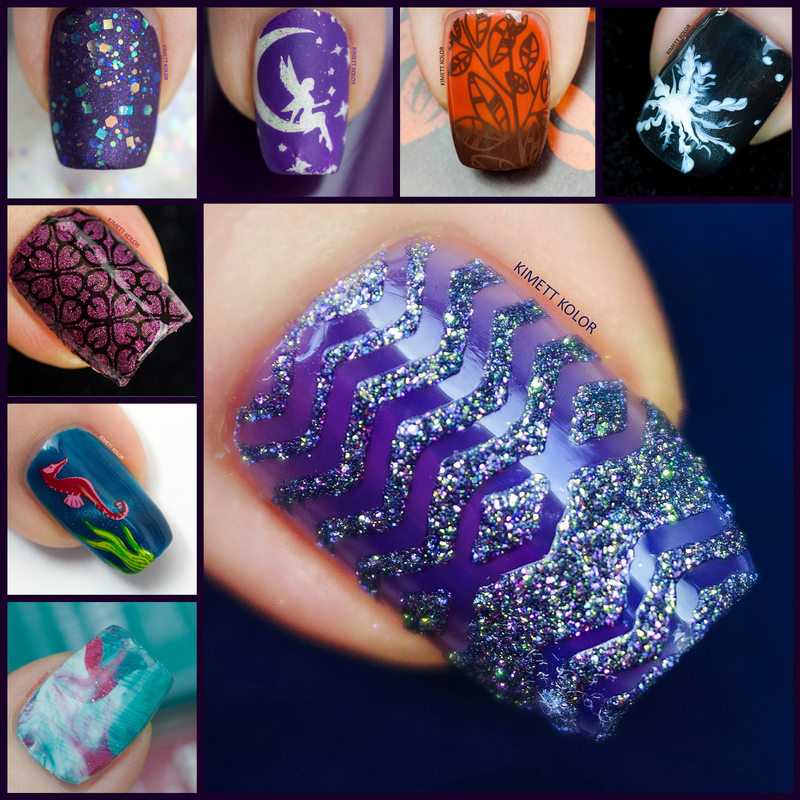 There were many fun and beautiful polishes involved in this group of designs – a thermal, a couple magnetic ones, shimmers, a jelly, a texture, flakies & glitters, and last but not least, a few cremes. And, I even remembered to try out matte top coats a couple times. Lots of liquid goodness!! Plus – a new kind of layering stamping plate came out to play. Phew!! A veritable nail art smorgasbord right here. You might recall that I set some goals for myself when welcoming in 2017. Well, let’s see how I did this first quarter. Do It For Me – I think that I did fairly well on this one. At least I remember saying “No”, or at least not committing to some things that otherwise I would have joined without contemplation. So when I look back at the nail art that I did, I’m happy in that I met this goal. Debut of polishes to blog (Untried’s) – Here I think I did well considering there were only 9 posts. I used a wopping 23 polishes that you hadn’t previously laid eyes on yet!! I’m not going to worry that 8 of those were stamping polishes in one design…because, hey they still count. 😉 In total, I’ve used roughly half of my collection so far…I’ve got a bit of catching up to do, huh? I was recently asked how many of the stamping plates in my collection have I shown. Gulp. I’m hesitant to figure that one out…but it might be fun to track….we’ll see. 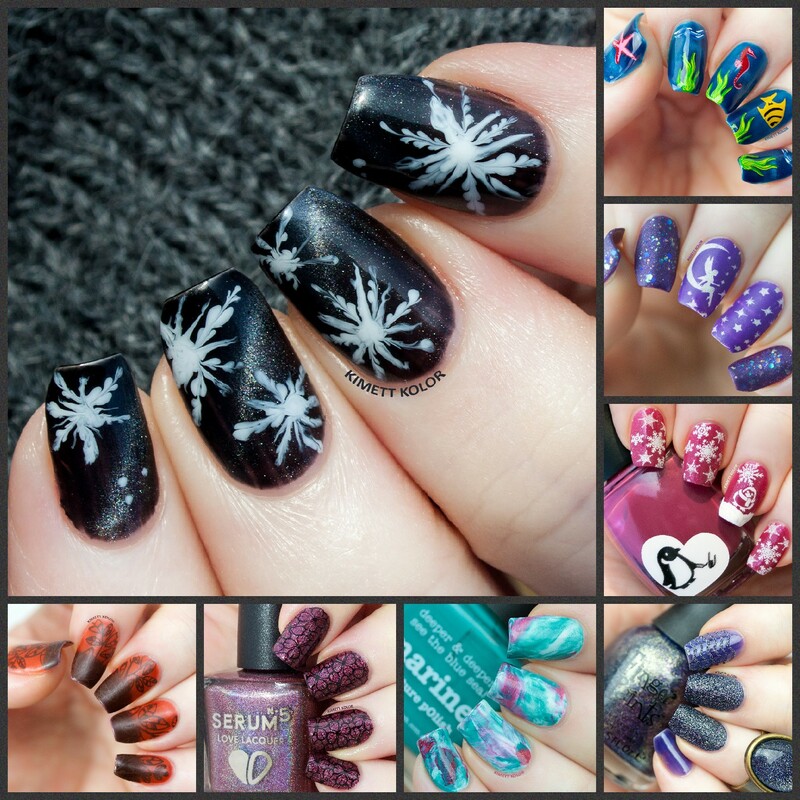 Requests – I didn’t get to doing any requested nail art designs from your entries of last year’s giveaway. Note to self: get those on the calendar!! Geesh! Posting schedule – Well, I didn’t exactly bomb at this, but I have started out a bit slower than the pace needed to make my desired goal of 60 posts for the year. On the other hand, putting my positivity hat back on, I only missed it by 2. I can make that up!! Rah, rah, sis boom bah! Tools – Me and the dreaded tweezers have actually done a bit better together. In fact, I proclaim that from this day forward I will not call them dreaded. See how accommodating I can be? Style – And lastly, have I started developing my own “style”? Um. What the heck did I mean? No, just kidding. I’m not sure that this is a goal necessarily…I think it will either happen or it won’t. So I’ll leave it at that for today. It’s been a long while since I’ve mentioned nail care on the blog, hasn’t it. Often I mention (okay, I remind…okay, I nag) that while reading my posts it would be a good time to slather on your favorite cuticle oil or balm. I’m sure it is because you will be so thoroughly engrossed in my captivating posts that it is a perfect time to pamper your nails to complete the blissful moment. When, I know in actuality it is because I have a tendency to babble on and this provides the little bit of time needed for it all to soak in. Literally. Seriously though, I’ve been meaning to do another post as an update to this one and it’s follow-up post published in 2013. For today though, I’ll just touch on two of my favorite products that I’ve discovered this year. First off, I have been looking to add another product to my arsenal for the night-time intense moisturizing & conditioning that I have been using for years, Qtica Intense Cuticle Repair Balm by Zoya. Because I suffer from hang nails (and in-grown nails if I’m really not careful), this product gives me the extra oomph needed to prevent that. My routine is to apply it just before falling asleep and let it do it’s magic overnight. Don’t get me wrong, I still love the results that product provides, but I’d been wanting to reduce the parabens and other chemicals in my life. After reading lots of rave reviews, I bit the bullet last month and ordered Nail Butter. I’m glad that I did. This product with it’s natural ingredients does the same thing for me (maybe even more), which was a big relief. My only gripe is that it doesn’t come in an option without a fragrance. Its smell is a bit overpowering at first. I will probably get used to it over time…as the results are so worth it. And, because it is a lighter formula than the one from Qtica, I have applied it during the day when I’m feeling the need for some extra moisture — definitely a plus for the Winter months. My second biggest and best discovery this year has been with cuticle oil. Over the years I have tried at least a dozen different brands. 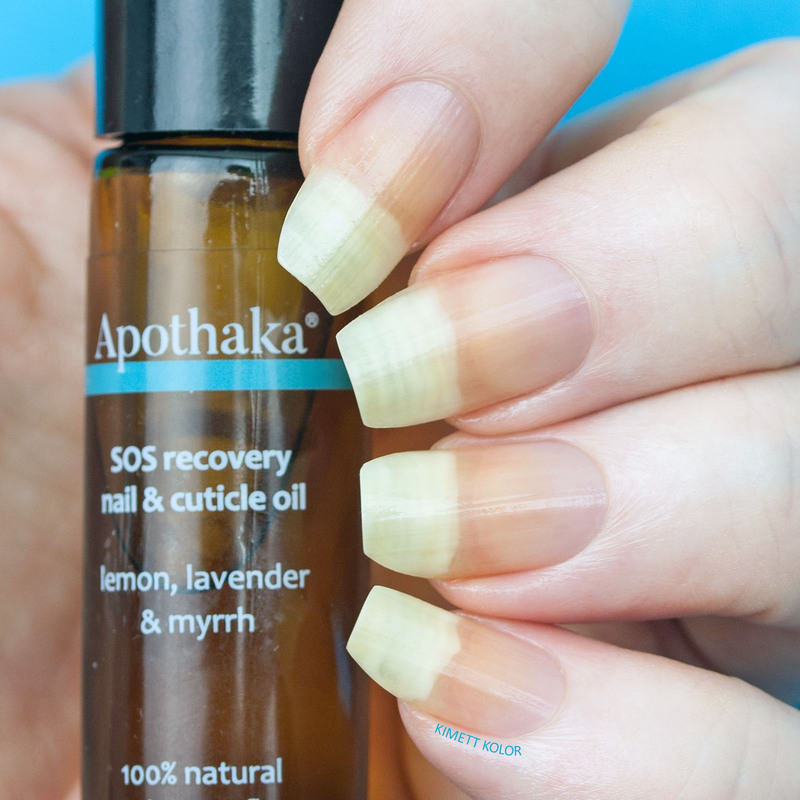 But…the day I first put on this new SOS recovery nail & cuticle oil from Apothaka will forever be memorable. (Photo below) Immediately I recognized that this oil is like no other and I felt the most diva like I have since I got a gift certificate to a fancy spa many years ago. But, the real kicker is how well this oil has worked for me in a relatively short time. Not only does it provide the right balance of moisture, but it is taming my cuticles so that they’re less noticeable and healthier too. And my nails are keeping that flexibility that I’m always seeking (my nails are naturally hard which can lead to breaks). 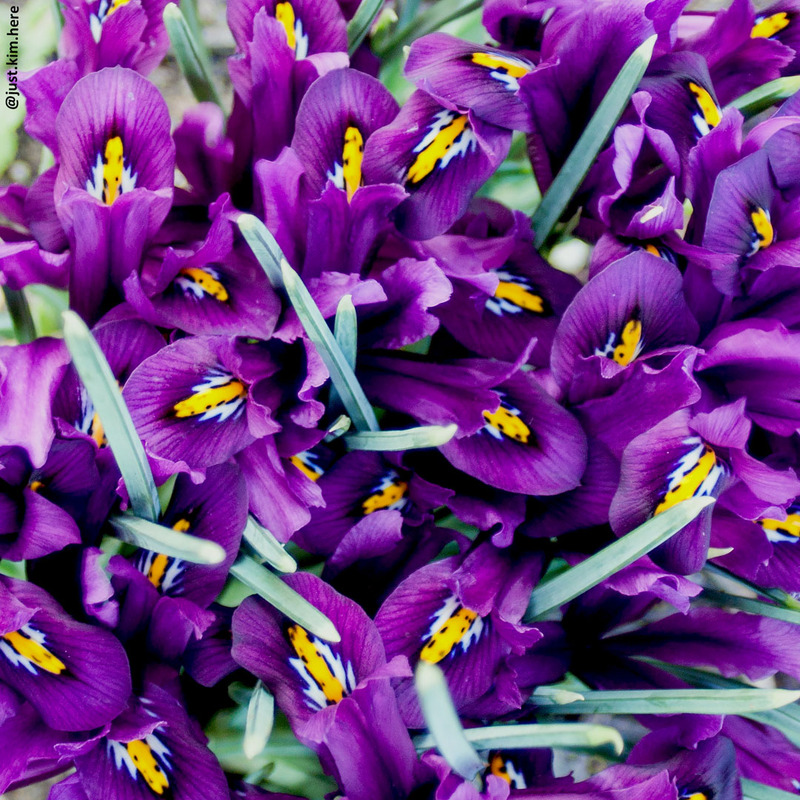 Plus, they’re growing like weeds! Overall, I’m very satisfied with this product!! The picture below was taken just 2 weeks after I swapped out my other army of cuticle oils for this one. Now, I can honestly say that I don’t need multiple oils – this ONE does it all. Here are my naked nails. Seriously, I’m naked here people!! There is nothing on my nails or hands but the oil which was applied about 5 minutes before pressing the shutter button. And, because I really think everyone should at least try this oil — below are some the links for more information and reviews, and one to buy it – because you really, really should. Yes, that’s a lot of really’s. I could write several more paragraphs about the awesomeness of this product made with love in London…but I’m going to skip that for today because I know deep down you just believe me and do anything I tell you. Cult of Kimett? No way! Okay, maybe…just a little. In a good way. Since you’ve seen me naked now….I guess I could include a few tidbits about the person behind these nails. Yeah, I know, it’s a bit backwards. I guess it isn’t recommended showing yourself naked on the first date before asking at least a few pertinent questions…you know, like are you a serial killer? LOL But, hey — what the heck. Maybe it will give you some laughs. Oh. You want to see more of me? Sorry, I’m too shy. But…how’s this? I am short. No really short. Like only a bit taller than an elf. Ok, alright. I’m 4 feet 10 inches (before my spine surgeries…I refuse to look at my current doctor’s measurement. I have naturally curly hair, that is not so much brown anymore. And I have blue eyes. Geez, now I feel really exposed…on to the next question, please…. Where all of the elves are made of course! Or wait, no, I’m sugar and spice and everything nice — so I must have been cooked up in a fairyland kitchen. No? Ok. You got me. I was born in Massachusetts. I’ve lived in several states, some include Connecticut, Pennsylvania, and Florida. Currently I live in Ohio with Mr. Kimett. Although I’ve visited Ireland, I’ve never lived outside of the United States. Well. Duh. It’s Kimett. I mean, it’s Kim. Or one of those. 😉 I’d like to tell you that I’ve never had any other nicknames…but I’ve told you how tall, ahem, short I am…so, you know I’d be lying. Another silly question — oh, wait, take this seriously Kimett — ALL of them!! I really do like all the colors equally. But, I do have favorites when I comes to certain things. If we’re talking clothes, my favorite color is blue. If we’re talking towels or other decorative items, my favorite color is yellow. 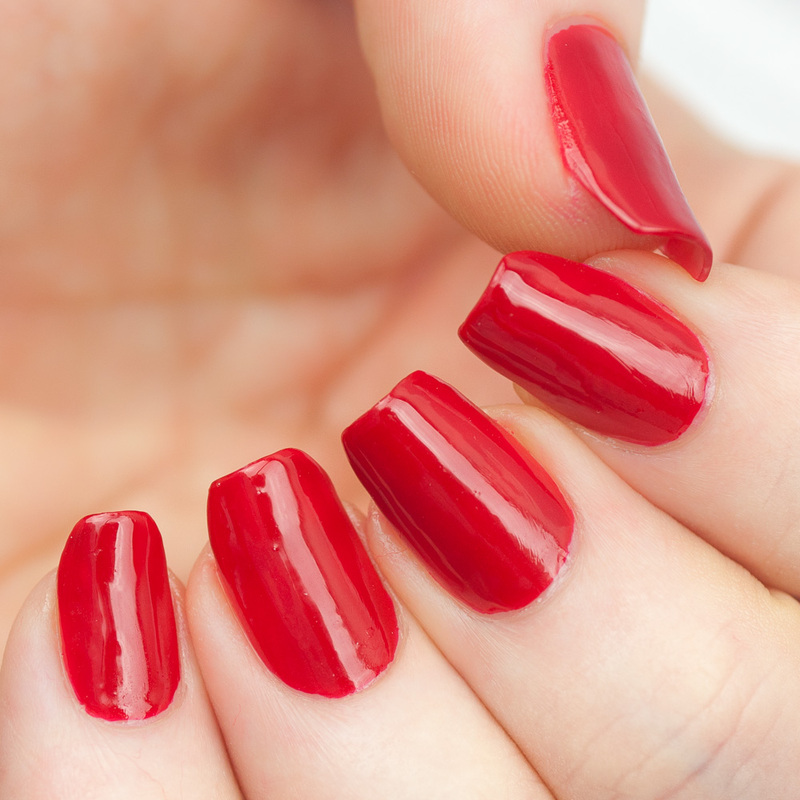 Now if we’re talking nail polish…my favorite color to wear (alone – yes, alone – gasp!!) is …. it would have to be … ummm … [beads of sweat are forming on my face] … (I better whisper it because all the polish bottles are behind me) … it would be pink. Specifically, a red toned coral shade of pink. That’s the color I reach for when I’m just painting my nails because they need something on them to protect them or if I want both hands to match. Yeah. That’s my answer. I’m NOT changing my mind. Because if I did change my mind it would be … No. Just No. Next question, please. What do you do when you’re not painting your nails (or blogging)? Are you Team-Gold or Team Silver? What 3 items would you take with you if you knew you were going to be stranded on a tropical island for a year? My first item is a no-brainer. No, not nail polish. It’s my husband!! (After he reads this post later when it appears in his Feedly…I will gently explain how this is flattering that I consider him an item…) Now….does this island have wi-fi? How about running water? There is a hotel, right? Why are you laughing? What is your favorite season? And why? What’s the best decision you ever made? What’s the worst? Well, of course deciding to take up nail art is the best one eva! But…these are supposed to be more about the gal not the nails…let’s see. I think the best decision I ever made was to drop out of college. Twice. Yeah, you read that right. It’s because each time I did, I then found a better and even better college to attend, ultimately graduating with a great sense of accomplishment. (And, besides if I had stuck with the first one, I’d have never met Mr. Kimett. <3) Um…now the worst decision…that’s a tough question…I think it was when I decided that this was a good idea to interview myself…LOL. Let’s leave it at that, because this has gone on long enough!! Now it’s my turn to ask you a couple questions. Did any of my answers surprise you? Don’t worry, I won’t always bore you with this type of personal trivia, I promise. Actually, I’m thinking in the next round up that I’ll show you some of my nail room. Or other stuff about how/what I do as it relates to nail art and blogging. 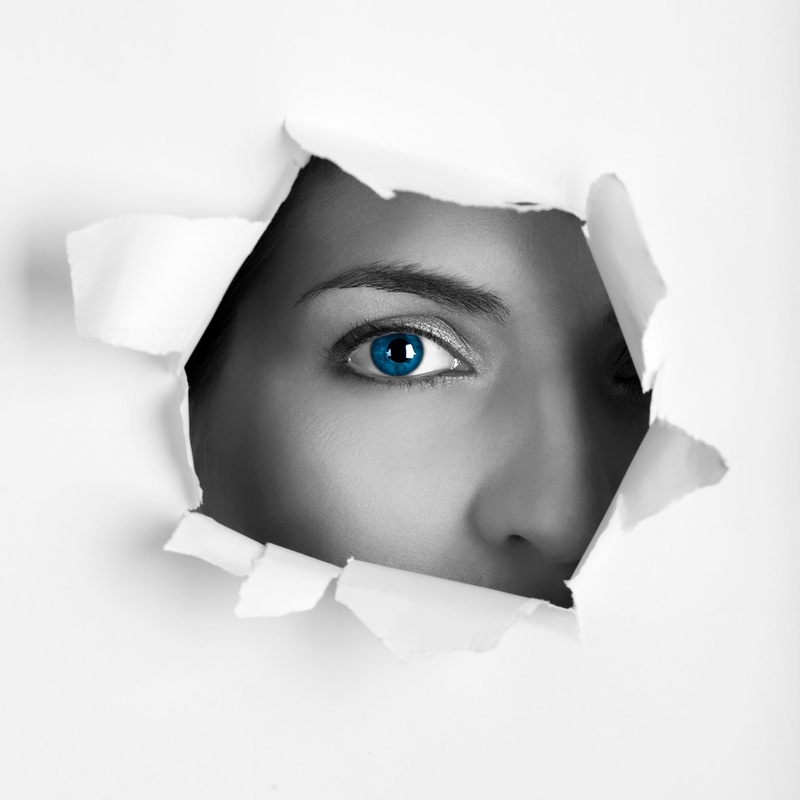 Do you have any specific questions or topics you’re interested in hearing about? 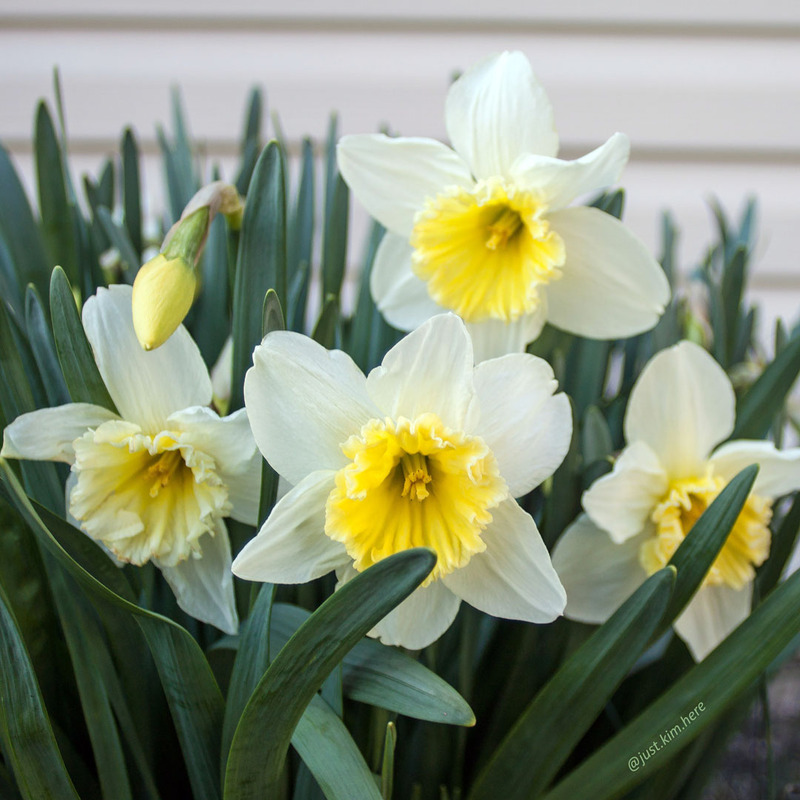 How about wrapping up this kinda crazy post with some pretty Spring flowers from my personal Instagram feed? I’ve been all over the place today…so why not? Besides…maybe there’s some nail art inspiration here…. I’m so grateful for everyone who has supported me on this journey so far. I cherish every sign of encouragement. Thank you from the bottom of my heart!! !